Moscow air defences – in other words, that Moscow would be protected by guided weapons similar to Bloodhound. The next question was then how to deliver the Bomb from the time the defences became too formidable for the V bombers to penetrate. In the early 1950s, ballistic missiles were not yet an option. Britain had invested heavily in the V bomber force, so that any ideas to prolong their active life would be very welcome. Hence the idea of a ‘flying bomb’ evolved. 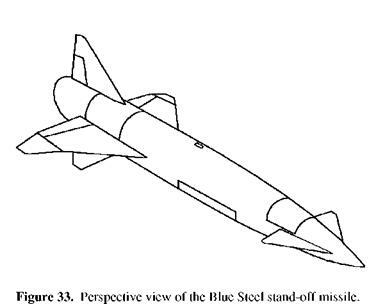 Initial ideas in the late 1940s had centred on a system called Blue Boar, which was a television guided glide bomb. This proved too limiting, since cloud and bad weather could obscure the television picture, whilst the radio link between missile and aircraft could easily be jammed. Instead, thoughts turned to a longer range powered device. This was not a flying bomb in the V1 sense, whose guidance had been extremely limited, but one that would be able to deliver its payload with considerable accuracy. Nor would it be a cruise type missile, since the technology for long- range guidance, terrain following radar or satellite navigation also did not exist at that time. Instead, inertial guidance would be used, which could be accurate enough at relatively short ranges. The missile would be released from the aircraft, immediately climb to a considerable height, cruise at high speed – around Mach 2 or so – then dive down onto the target. The theory was all very well, but in 1954 reality was something else. Britain was still working on its first fusion bomb, so it was difficult to estimate what payload size and weight would have to be carried. The next problem was the inertial navigation. As the US was discovering with Snark, Matador and Regulus, navigation over considerable distances was a problem. This was one of the reasons why a range of 100 nautical miles was chosen for Blue Steel. The problem was made more difficult since it would be launched from a moving aircraft whose own position might be uncertain. A further problem with cruise type missiles is their relative vulnerability to enemy defences unless they fly at a very low level, which was, again, not possible in 1954. Hence OR 11321 specified a speed of Mach 2.5 at 70,000 ft or higher for the vehicle, although in 1954 supersonic speeds were an area still fraught with unknowns, and supersonic wind testing was still very difficult. Yet another problem was that at these speeds the skin of the vehicle would start heating up as a result of friction with the air. Aluminium airframes would not be suitable at high Mach numbers (this is one of the reasons why Concorde and similar aircraft are limited to around Mach 2.2) and the only real alternative was stainless steel, which was difficult to work with. This was more unknown territory. The time period is significant – it is assumed that by 1960, the V bombers will no longer be able to attack the target directly. The next assumption is that by 1965 some other form of delivery will have taken over, although this is still too early for the Air Staff to be thinking specifically of ballistic missiles. This bomb is indubitably much simpler than a fighter aircraft in the range of equipment that has to be provided. On the other hand it is a big step to go from the present speed range to Mach Numbers of 2 and above and again in comparison with the development of a manned fighter, it is to be expected that the production of the many vehicles required for firing trials will lengthen the development time.